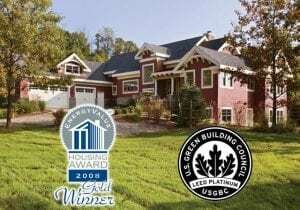 Selecting a timber framing company to design and build your dream home is one of the most important decisions you will ever make. Over the past 40 years, Riverbend Timber Framing has helped thousands of people design and build their custom timber frame homes. Read on to learn about some things you should know before selecting a timber framing company. While the quality of building materials in one’s home always matters, it is especially important in a timber frame home. Unlike most North American homes, the structural shell of Riverbend’s timber frame homes is not stick built and does not use common building materials, such as 2x6s. Instead, Riverbend uses timber frame techniques that date back centuries, including mortise and tenon connections. This makes the quality of the wood used of utmost importance. There are several factors that go into ensuring quality wood is used in your timber frame. First, find out where the wood originates. This doesn’t mean you need to know the forest itself. It does mean, however, that you should ask about who sources the wood. Is it a regular employee of the company or a contractor? Is it someone with exacting knowledge of what makes for a perfect timber or is it someone charged with finding the best deal? Another facet of wood quality is its structural strength, which ties into the wood species used. This isn’t to say only one or two species of wood are acceptable in a timber frame. Oak, Douglas fir, pine, cypress, and other woods are all acceptable. It goes back to the quality of the initial wood. Is it free of heart center Douglas fir, for example? Finally, ask about the manufacturing of the timbers themselves. 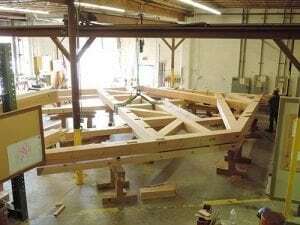 The level of craftsmanship required when fabricating a timber frame is no easy feat. It takes years of experience to perfect the skills needed to create beautiful timbers. In addition, today’s timber fabrication demands a blended skillset of math and artistry. A harmony between modern machinery and man is ideal. Suss out who the team members on your project will be. Again, are these people who work for the company or are they independent representatives, contractors, or a separate business altogether? You might be wondering why this matters to your home, and it’s a fair question to ask. It matters because you want each member of your project team to communicate not only with you, but with each other. The level of communication needed between your team goes a long way to ensuring you receive what you expect on time and at the agreed upon price. Technical proficiency of the team members also matters. You want team members who are not only well-versed in their respective areas of expertise, but who are reliable, with organizations that are financially solid, and with immediate access to the resources your project will demand. Having your team of experts under one roof has numerous advantages and no downside. If your timbers are being fabricated by a team of craftsman sharing a roof with your architect and your project manager, congratulations. Your life will not only be easier, the levels of respective expertise and accountability are typically greater. You probably expect to meet with your designer or design team and later receive a design that represents your dream home. Getting a design you like or even love is rarely difficult. Getting one you love that also fits your budget, however, can be tricky. Find out as much as possible about who will be designing your timber frame home. Of course, you ideally want degreed architects on your project. But you also need to consider the individual’s experience with timber frame homes. You may engage an extremely talented and well-respected architect or designer but if that person is not versed in designing a timber frame, it can make a difference in the final home. Though it may seem obvious, it’s important to understand that designing timber frame structures– be they bridges, barns, or homes– requires experience in and with timber frame. After all, how well might it work out if your designer doesn’t know what a bent is? It’s okay if you don’t know (yet!) but you do expect your floor plan to represent what can actually be built using timbers. Joinery knowledge matters. Truss expertise does too. And, the ability to produce a plan you love, that can be built within your designated budget, should be your expectation no matter who you choose to make your dream home a reality. It feels good knowing your “green” builder recycles or donates wood scraps and repurposes old wood. But after your home is built and the proverbial dust has settled, does this make your new home green? Is it energy efficient? Is it minimizing its impact on the land? Not very likely. 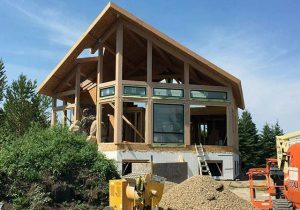 Since energy costs show no sign of decreasing, it is important to be proactive about designing your new timber frame home with energy use top-of-mind. To do this, you’ll need a designer and a builder with verifiable experience in energy efficient design and building processes. So, what should you look for in advance? Start with the basics of asking about your home’s structural shell. Many highly energy efficient homes employ ICFs, short for Insulated Concrete Forms, and part of the aforementioned structural shell. ICFs integrate the enormous strength of a concrete core surrounded by the proven insulating capabilities of foam. Since concrete on its own conducts heat and cold, the use of ICFs negates that ability, ensuring the concrete will not alter the interior temperature of the home. Typically used in a home’s foundation, ICFs can also be incorporated as walls. Your build team should know the what, why, and how behind ICFs as their use is not new. If your architect or designer doesn’t know what ICFs are, this too has to be addressed—before your home is designed or a single piece of your land is excavated. SIPs is the acronym for Structural Insulated Panels, and these too will drive significant energy savings as well as costs related to the same. Unlike walls created with 2x 6 studs and fiberglass insulation, SIPs are comprised of structurally laminating a continuous core of expanded polystyrene (EPS) insulation between two performance-rated oriented strand boards (OSB). Thus, if SIPs make up the walls and roof of your home, it’s not difficult to imagine the difference in energy usage no matter what the season. When it comes to your home’s structural shell, experience matters. Beyond the obvious order of work being performed at your build site, footings before ICFs, ICFs before SIPs, for example, find out as much as you can about the level of expertise that goes into the work of the structural shell building system. When your team knows the ins and outs of a structural shell building system using ICFs and SIPs, construction speed increases. To help teams who are not familiar with ICFs and SIPs, Riverbend offers technical assistance as needed. In the end, your structural shell has a higher overall thermal resistance and significantly lower air leakage rates, both of which are measures used to determine your home’s actual energy efficiency. So, your energy efficient green home really is green.